Country kitchens have come a long way. When we used to think of country, images of milk cans, apples, geese and gingham would spring to mind. 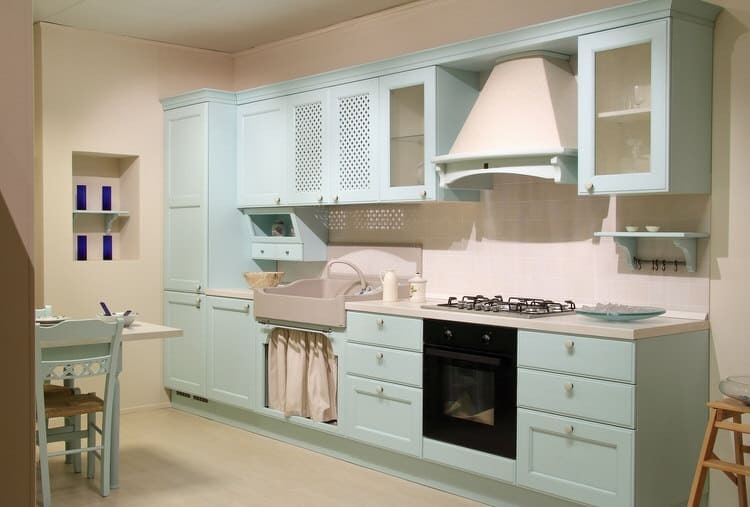 Today, country kitchen styles are as varied as their origins. English country, Provencal, farmhouse, Tuscan, colonial and lodge are some popular variations. 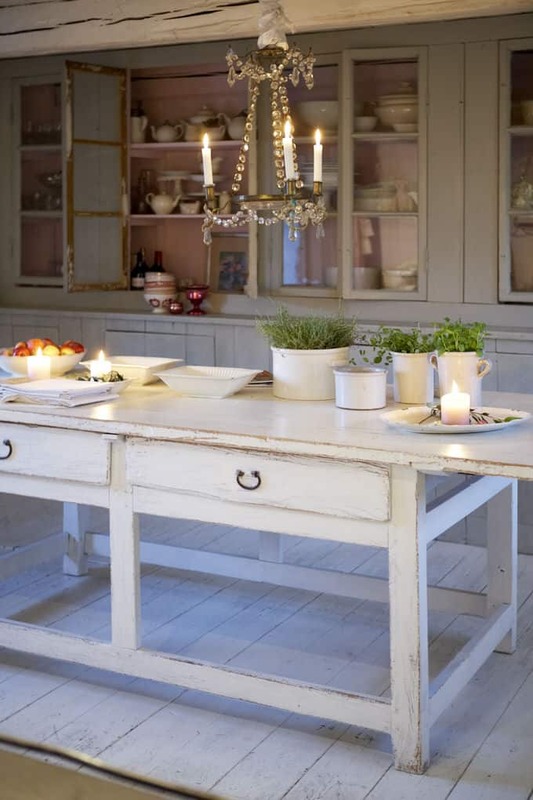 Despite their differences, all country kitchens have a warm and welcoming feel. Rustic touches mixed with modern conveniences typify country style. A mix of rough-hewn flooring, beadboard accents, antique glazed cabinets, decorative baskets and recycled items play a large part in creating a successful country kitchen design. Some kitchens look as though they’ve jumped right off the pages of a magazine—something to be admired and not enjoyed. Not so with a country kitchen. They are designed for day-to-day life. A combination of their sensible style and timeworn good looks makes country kitchens a favorite the world over. If you love the charm and simplicity of country kitchens, you’re in for a treat. 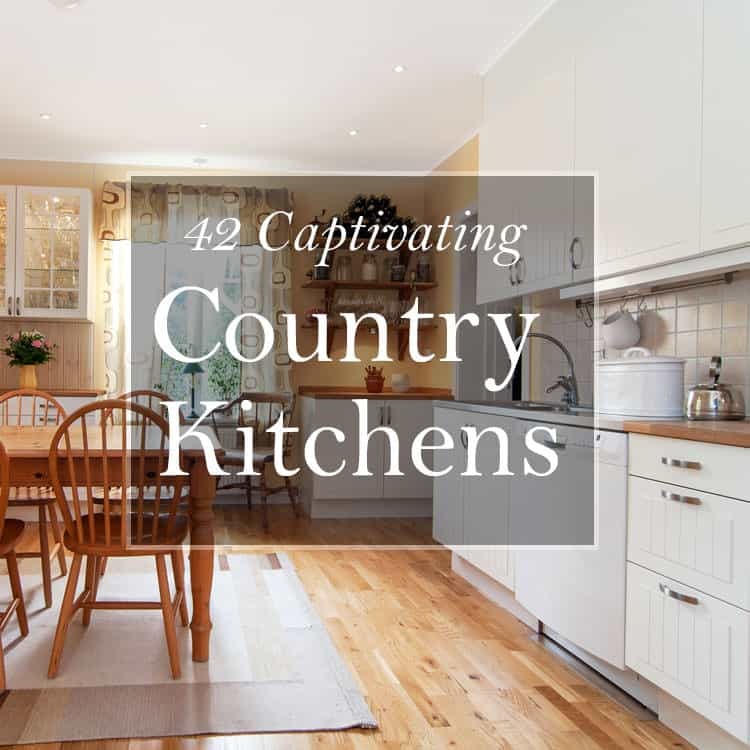 Here’s a charming collection of country kitchens that will please not only the gourmet but the casual cook as well. 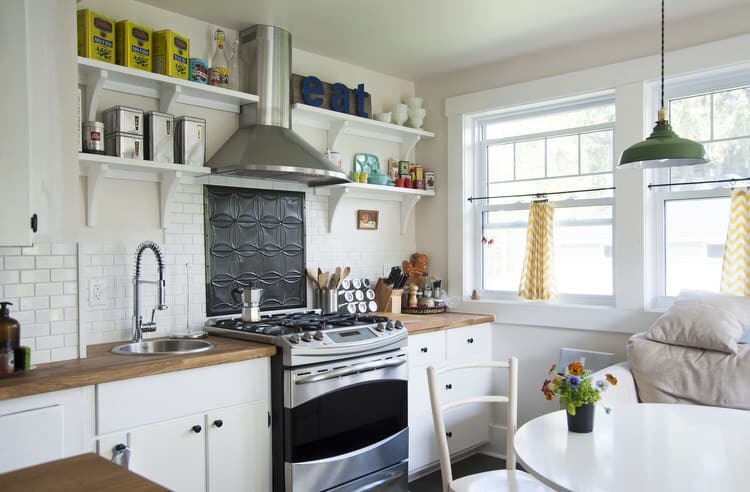 Fixing up the kitchen of this renovated farmhouse proved to be fun and relatively inexpensive. Tons of white paint covers the walls, ceiling and plywood plank floor. This dresser was positioned against an existing pass-through and converted into a work island. The drawers were replaced with wooden boxes made from salvaged lumber, as were the cabinet fronts below. Big islands look great in a country kitchen—especially an island that can double as a farmhouse table. This work surface with beautifully turned legs features a cool marble countertop, making it a great surface to roll out pastry dough. It is also large enough to seat a family of six, plus it can pull double-duty as the homework or crafting station. The owner of this cozy cottage decided not to install a dishwasher and instead went with a custom concrete farmhouse sink with skirted storage below. The retro-style sink can handle lots of dishes and takes care of roasting pans and oversized pots with ease. 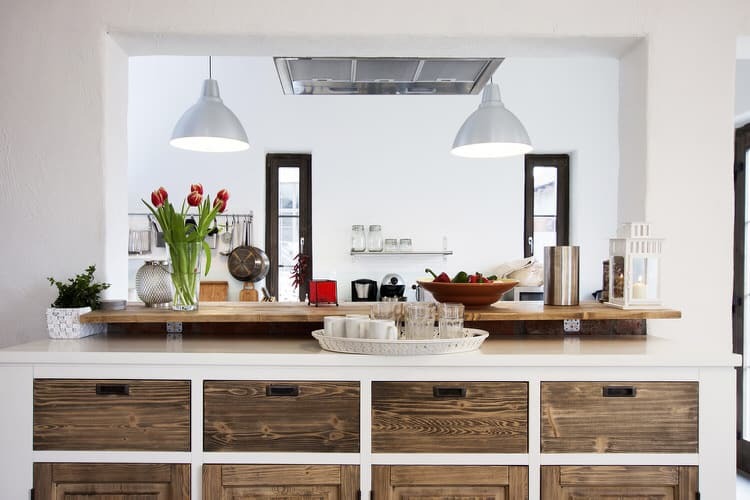 A local artisan constructed all the cabinets in this newly renovated country kitchen. They were originally going to be painted black to match the black enamel range, but the homeowner decided to leave them natural to match the companion farmhouse table and chairs. 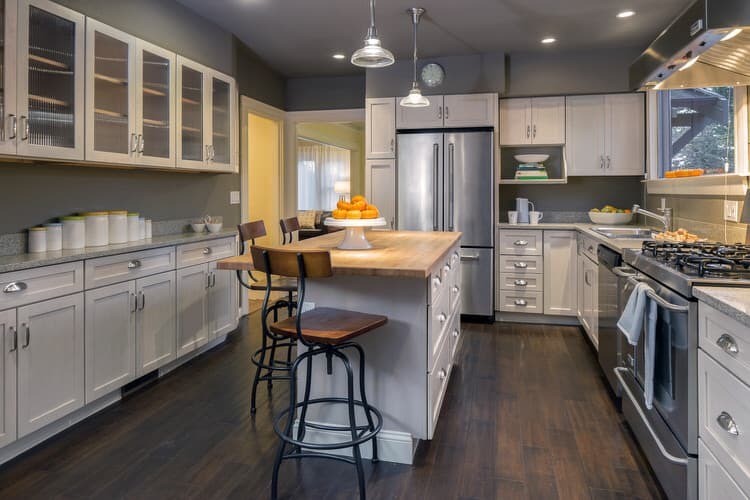 Pairing bright white Shaker cabinets with stained hickory countertops gives this kitchen a highly customized look even though they were ready-to-assemble units from the home improvement center. The open shelving with vintage accents reinforces the country theme. 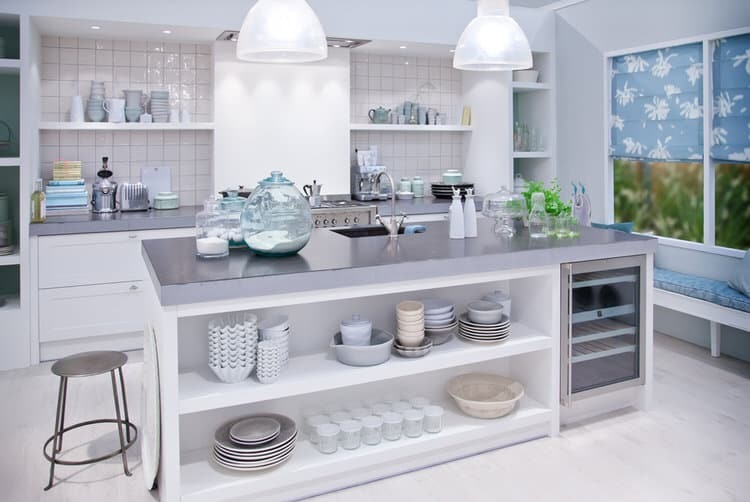 A neutral kitchen palette allows you to change your kitchen accessories as the mood strikes. Almost every surface in this room is the same shade of white. Most of the furniture is either metal or covered in pale blue linen. This country Tuscan kitchen artfully merges seemingly incompatible elements giving the space a feeling that it evolved over time. 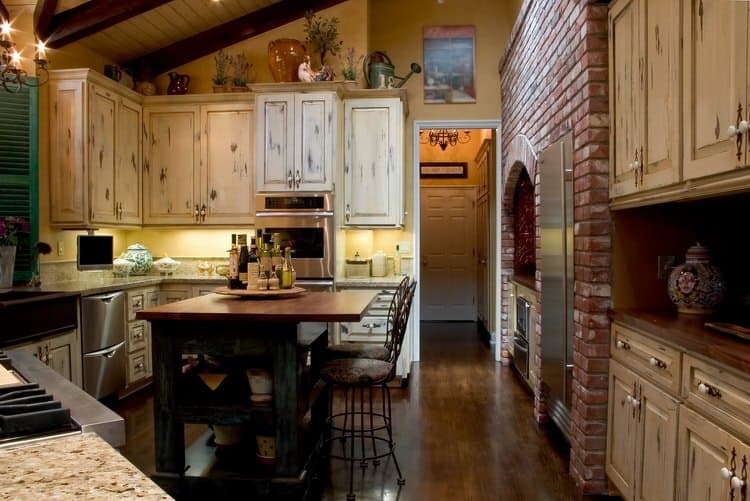 Authentic colors combine with natural textures to give the kitchen an eclectic personality. The steel blue furniture-inspired island anchors the room and its charmingly mismatched elements. 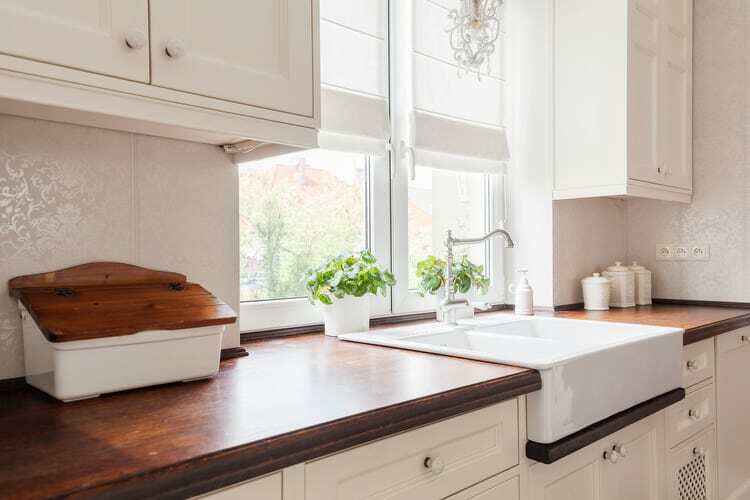 Solid surface countertops and modular Swedish cabinets freshen the look of this European farmhouse. 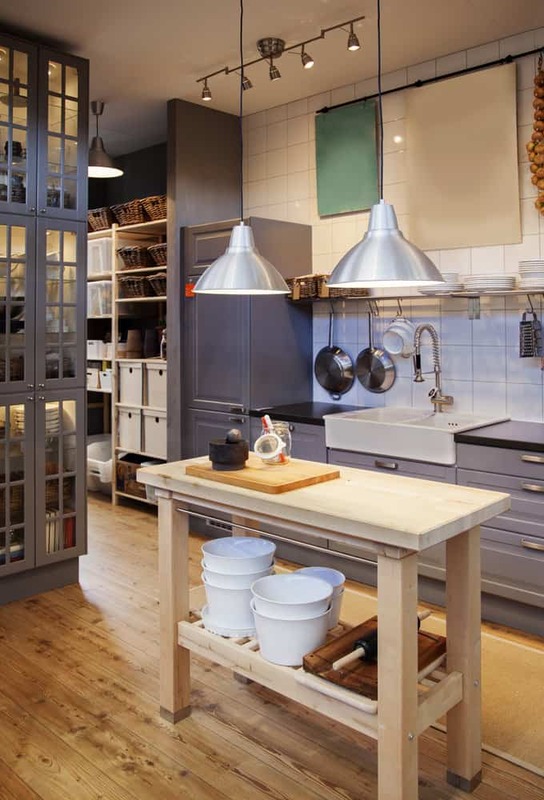 Task lighting is provided by metal industrial pendants. The addition of colorful accents throughout and aqua walls give this windowless space a cheerful countenance. 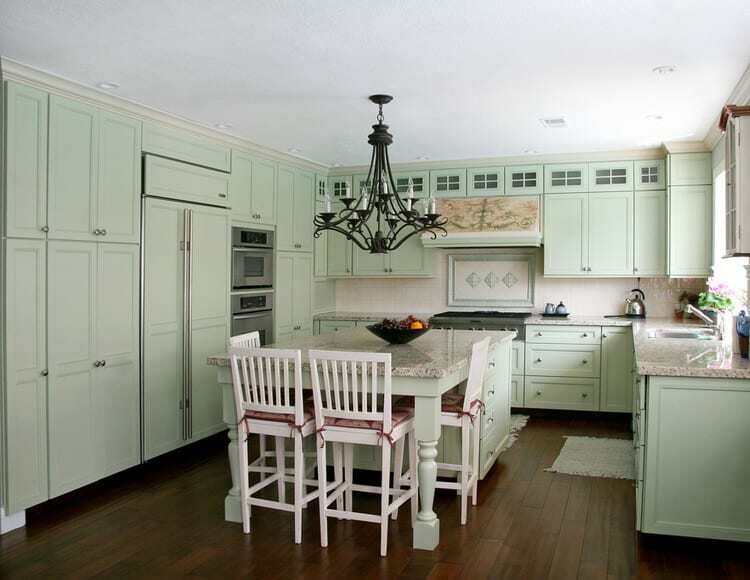 The owner of this ranch house opted for white custom cabinetry that looks like freestanding furniture. They removed plaster walls to expose beautifully weathered brick. Butcherblock countertops add to the natural good looks of this cook’s kitchen. A simple island was designed to contrast with the kitchen’s gray painted cabinetry making it a standout in this urban condo. The island top is made from natural wood and the other counters are rugged soapstone. A combo of track lighting and industrial pendants give this modern country kitchen just the right amount of illumination. The homeowners wanted to create a very large and unique island—and wanted it to look like an old general store counter. Their wish came true with this charcoal gray island complete with tons of drawer space, authentic bin pulls and even a spot to seat two “customers” at the end of the counter. 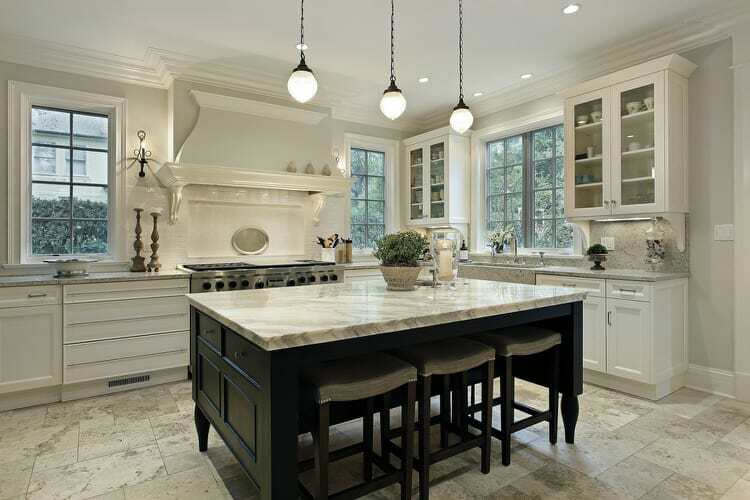 Topped with Cararra marble, it ties in beautifully with the white custom cabinetry. 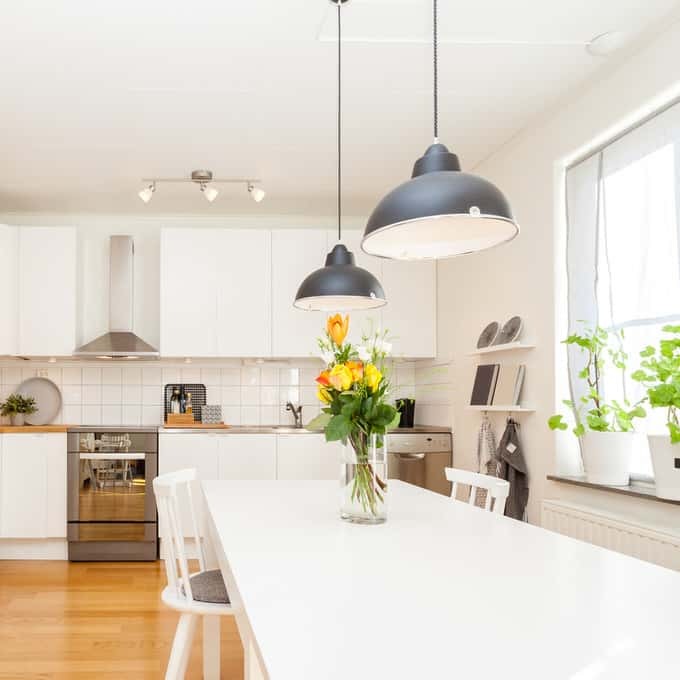 White is probably the most often-used color in country kitchens, easily allowing for the introduction of secondary color. Even if splashes of bold colors are added, they won’t overwhelm. 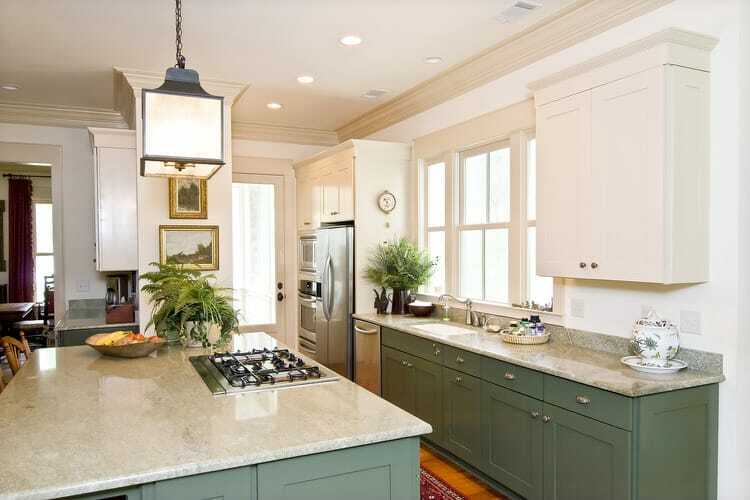 In this example, sage green is used for the lower cabinets and warm white for the uppers. Green grounds the space and is visually pleasing when paired with white. 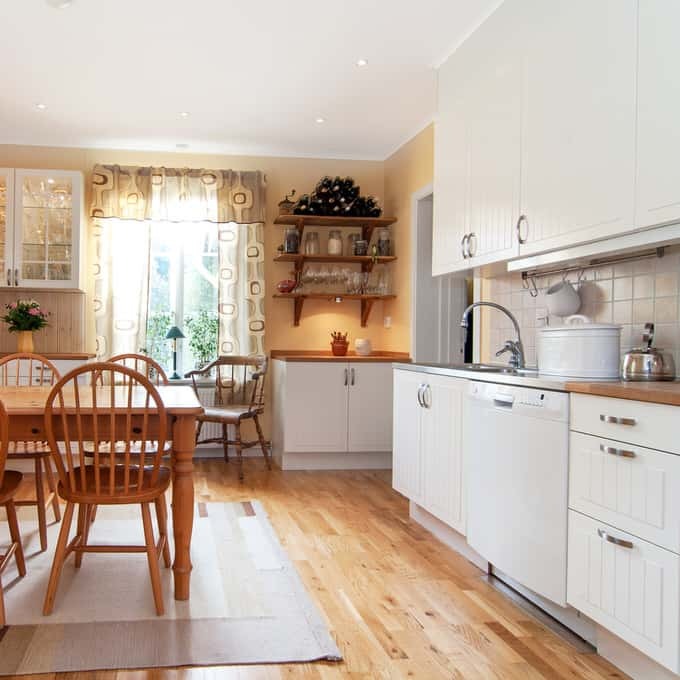 Smart space planning divides this gorgeous country kitchen into convenient and functional work areas. One side of the island is strictly for seating. The other side is for food prep, providing plenty of room for several people to move around the space at the same time. Rustic plank flooring, cottage cabinetry and a retro color palette give this kitchen traditional farmhouse style. The owner chose to install matching cabinet fronts to the side-by-side refrigerator so it would blend in with the surrounding woodwork. 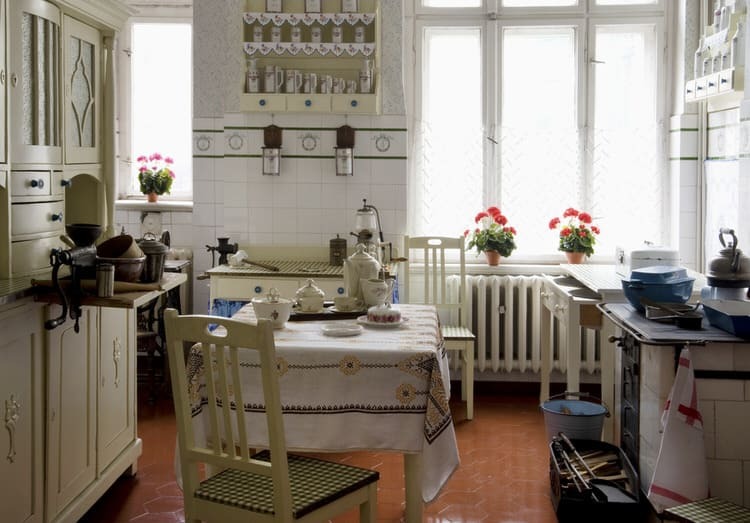 This European country kitchen blends casual comfort and Old World style. 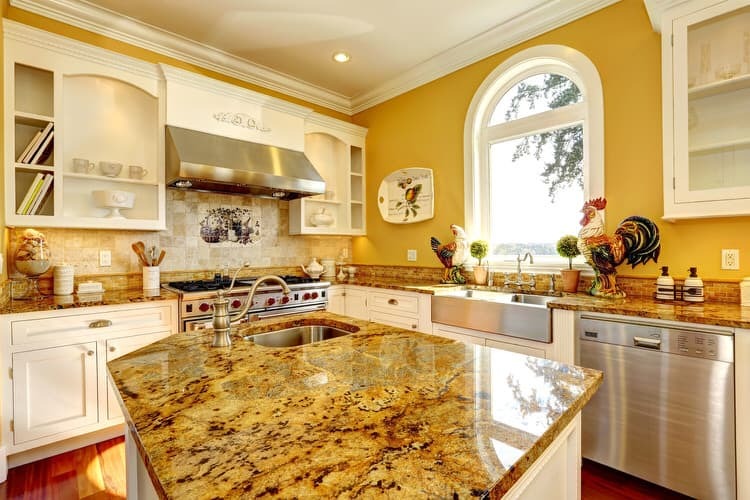 The oversized island beckons guests to pull up a stool or join in the evening’s meal preparation. Large islands are great because they can double as homework central or as a place to take care of household business like monthly bill paying. 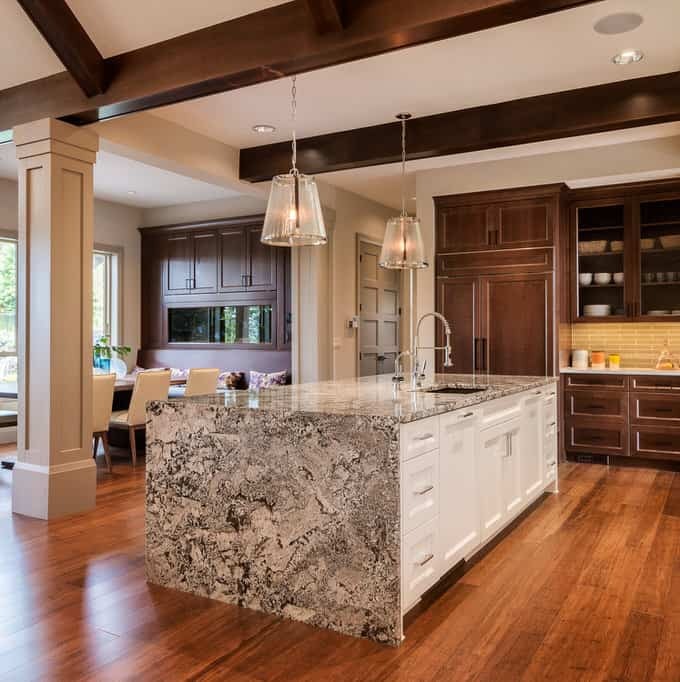 The thick stone countertops harken back to earlier times, while their clean edges add a touch of modern styling. They play nicely with the antique white cabinets outfitted with country-style bin pulls. The overall effect reinforces the kitchen’s traditional character. Sometimes we tend to overlook decorative lighting in the kitchen. The mini-chandeliers in this kitchen really make it exceptional. 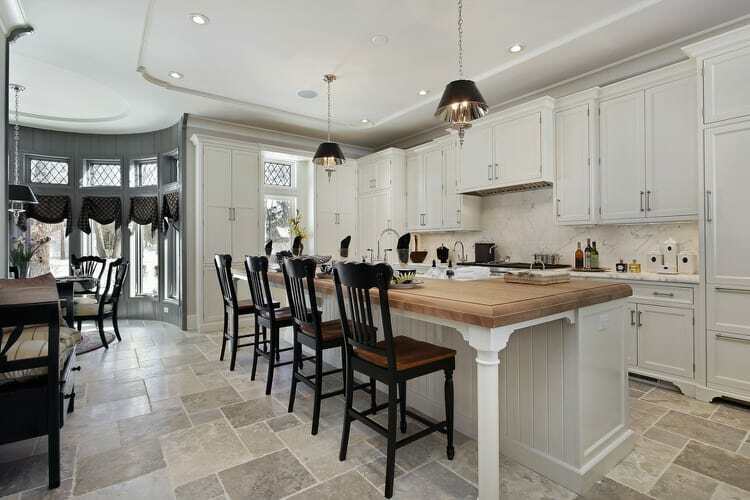 With all the gorgeous custom cabinetry and hardwood flooring, the fixtures serve as icing on the cake in this classic country kitchen. Mix old with new to get a fresh perspective on country style. The Windsor dining chairs and harvest table in this cottage kitchen are hand-me-downs from the homeowner’s great aunt. The warm wood tones look divine with crisp white cabinets. Finely-tuned details make this kitchen radiate with rustic country charm. An alder wood island creates the focal point while glazed white cabinets topped with dark granite create an air of sophistication. Multiple wood tones create contrast and warmth throughout this expansive space. Unconcerned with privacy, this country kitchen skipped curtains and opted for a fabric valance to add a little color to the predominately white space. 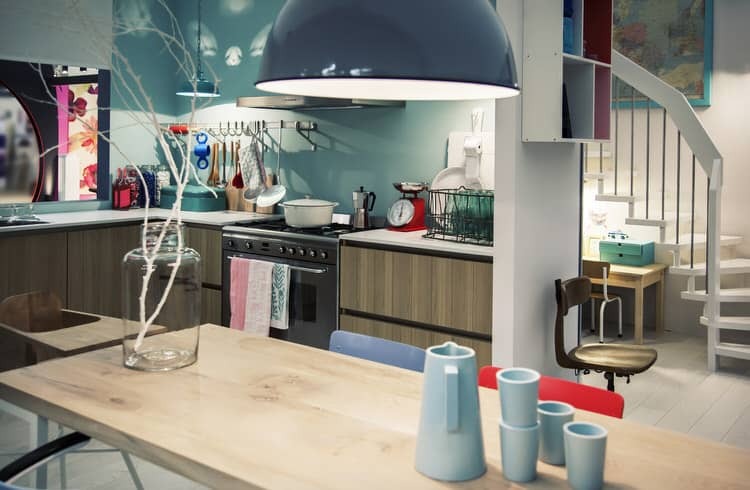 Milk glass pendants provide plenty of task lighting on work surfaces while keeping sight lines open. A butcherblock desk, granite countertops and antique stools add character to the country space. 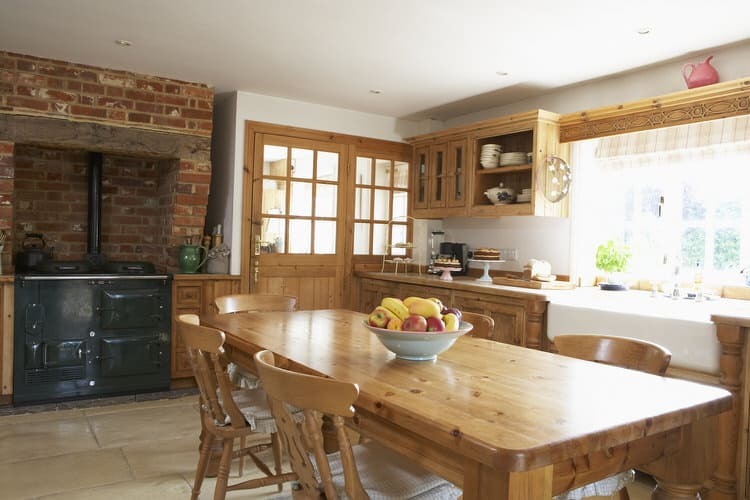 From its exposed wood ceiling and French terra cotta tile floor, this beautiful country kitchen still retains much of its historic features and charm. Contemporary pendant lighting, quartz countertops and stainless appliances were added to update the space and make it fully functional. This kitchen was originally a Colonial tavern and still has its original pine ceiling beams to prove it. 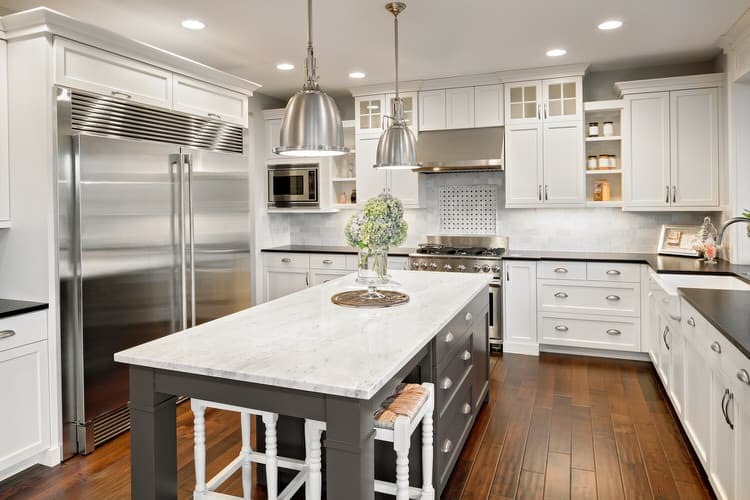 The cabinetry, light fixtures, salvaged flooring and range hood are traditional touches that stay true to the history of the home—with a modern twist. Shaker cabinets and farmhouse details make this small country kitchen big on style. The furniture-style cabinetry and apron sink look flawless with the oiled wood countertops to create a warm and inviting space. 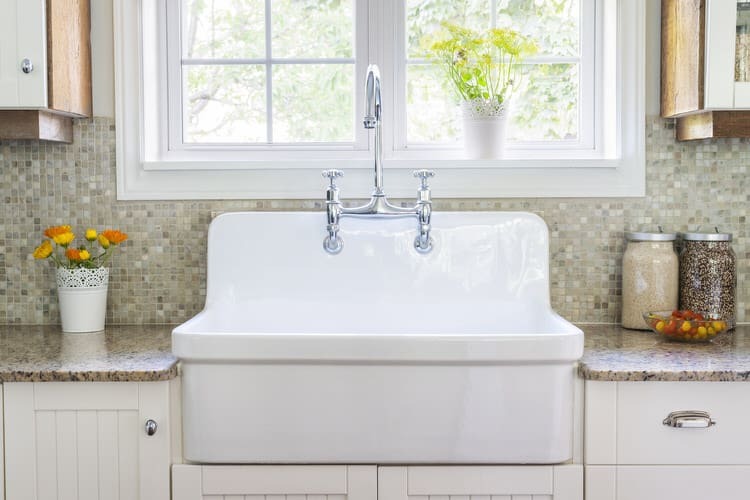 The two windows over the sink make space feel light and airy. Once you’ve created the perfect country background, bring in accessories to personalize the space and make it yours. 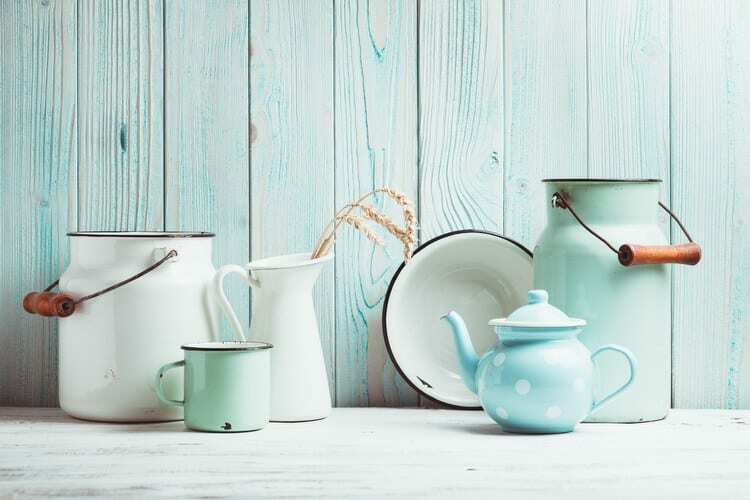 Items like enamelware, canning jars, ironstone and yellow ware add a hint of color to a white country kitchen. Be careful not to over accessorize; keep collections small to prevent the space from looking cluttered. Despite its white color palette, this rural California kitchen feels cozy thanks to raw plank flooring, open cabinets, country collections and welcoming accents. The addition of the bicycle is genius—it is also the owner’s main mode of transportation. You don’t have to spend big bucks to give your existing kitchen that down-home look. 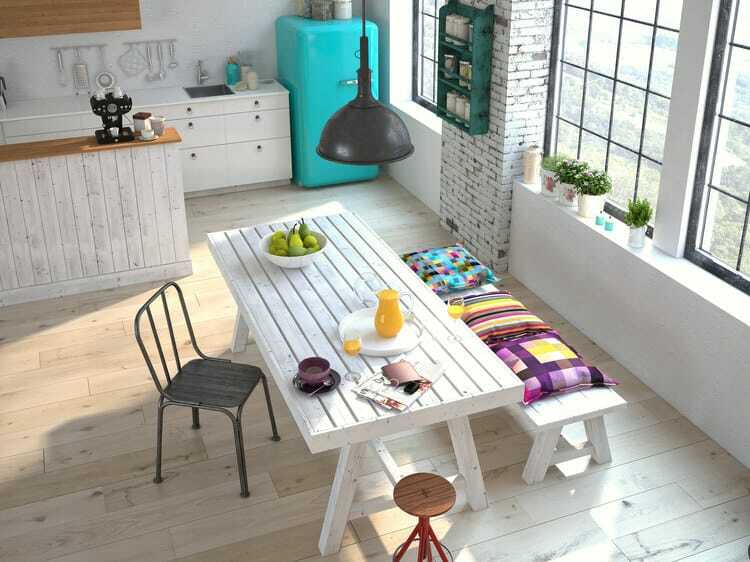 This farmhouse-style loft has an upcycled island made from an old cabinet and topped with wooden slats. The wood and metal stools came from a big box home retailer and the glass LED pendants are from the local home improvement center. Memories of meals cooked by the family’s matriarch inspired this country kitchen renovation. The deep green island was rubbed with wood stain to give it an aged look. 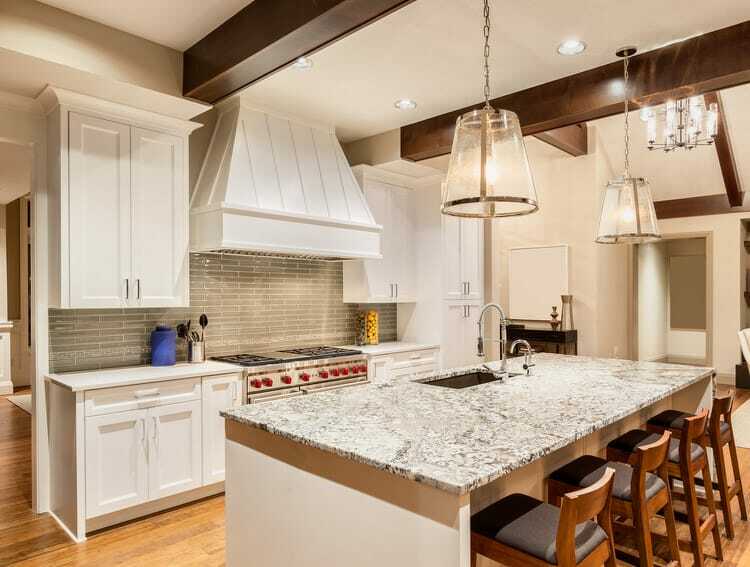 Its butcher-block top coordinates with the granite and natural wood countertops in the space. The original brick oven was converted into a modern range/range hood combination. Keeping kitchen pots and pans in plain sight not only gives a country kitchen a lived-in feel, it also keeps things handy for the resident gourmet. 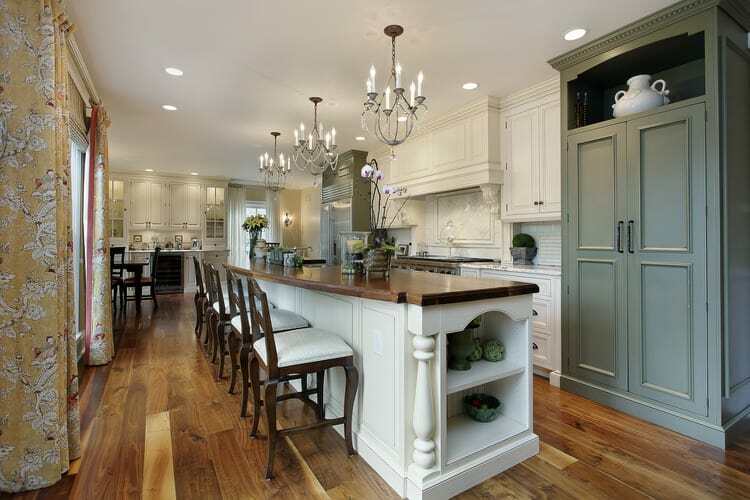 The warm maple flooring against the creamy white cabinetry and countertops provides tons of visual interest. 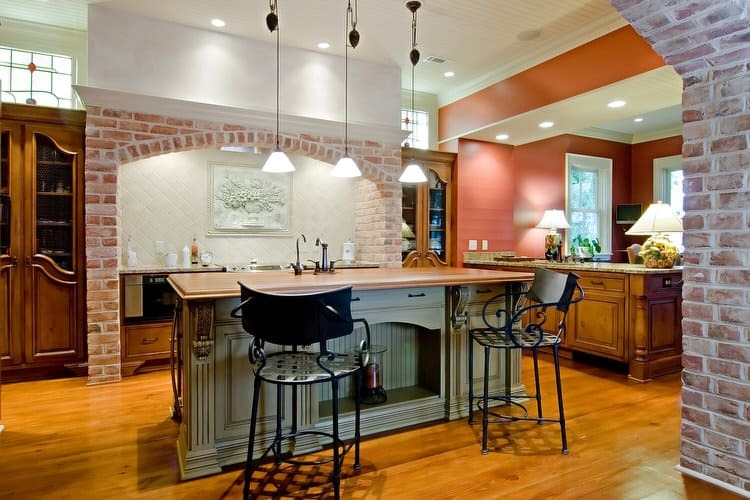 The island complete with a copper prep sink anchors the space. 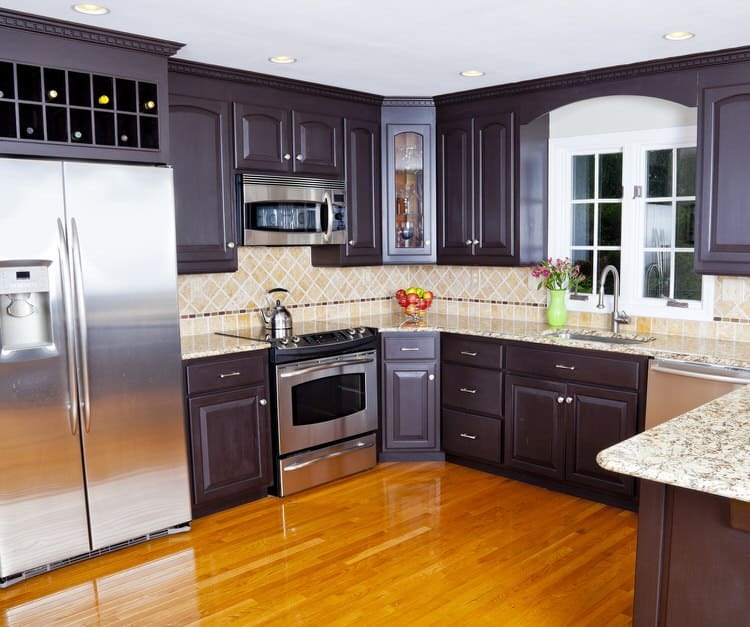 The owners of this farmhouse painted the cabinets in an antique black finish to give the kitchen a completely new look. The light granite countertops and backsplash pop against the dark cabinetry and this country kitchen a contemporary feel. French country influences abound in this kitchen, from the ornate range hood and acanthus detail right down to the decorative topiary. 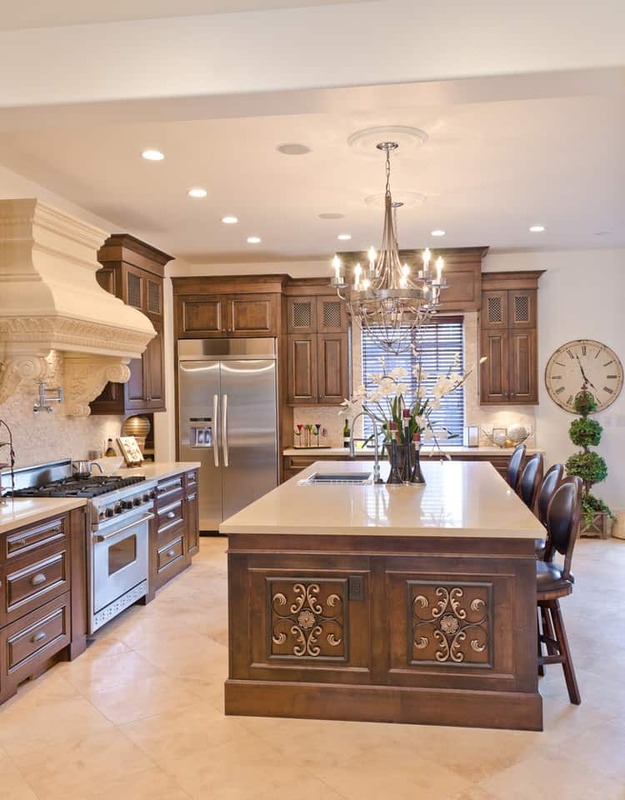 The faux stone range hood is a feature that really takes this kitchen to the next level. 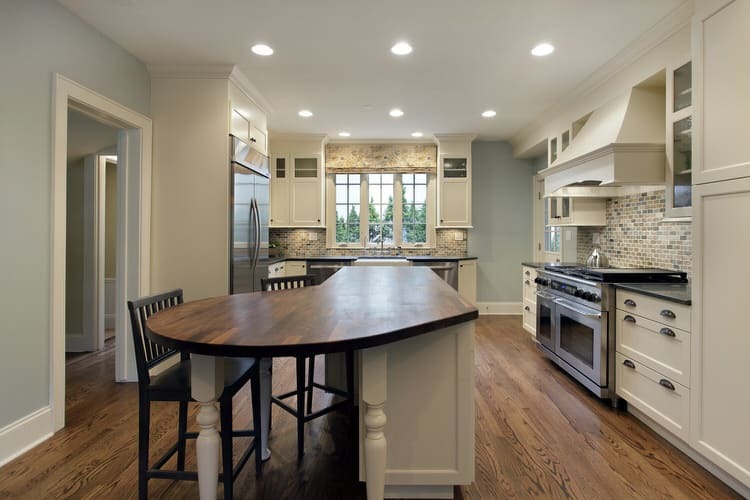 It looks stunning paired with the pecan cabinetry. Nothing says country like the vintage look of beadboard paneling. You can vary the board width and run it either vertically or horizontally. 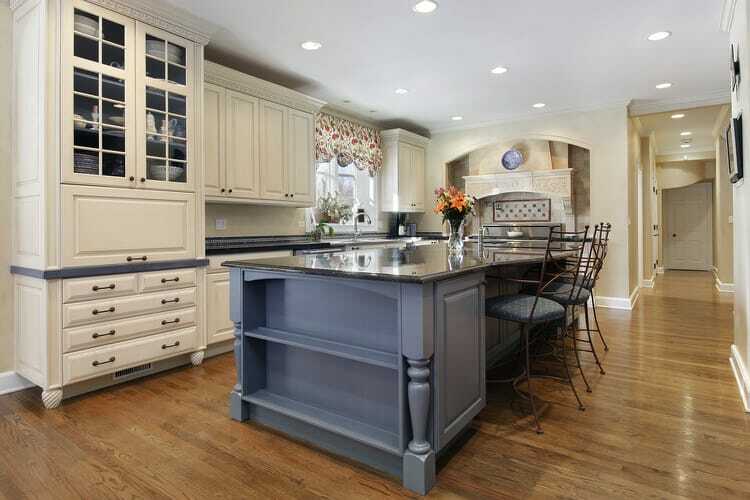 Paint it white as in this kitchen island or stain it a warm wood tone. Simple touches like beadboard create texture and give pieces a handcrafted look. Who says country has to be laid-back? 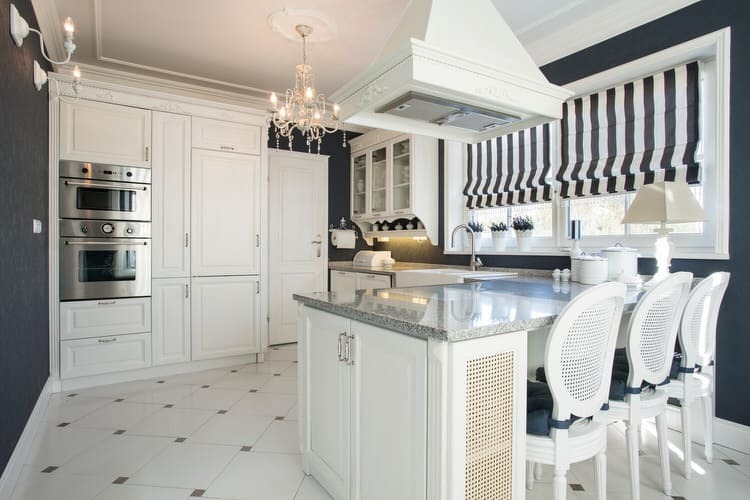 This kitchen definitely exudes elegance, but it has a number of country influences that bring it back down to earth. 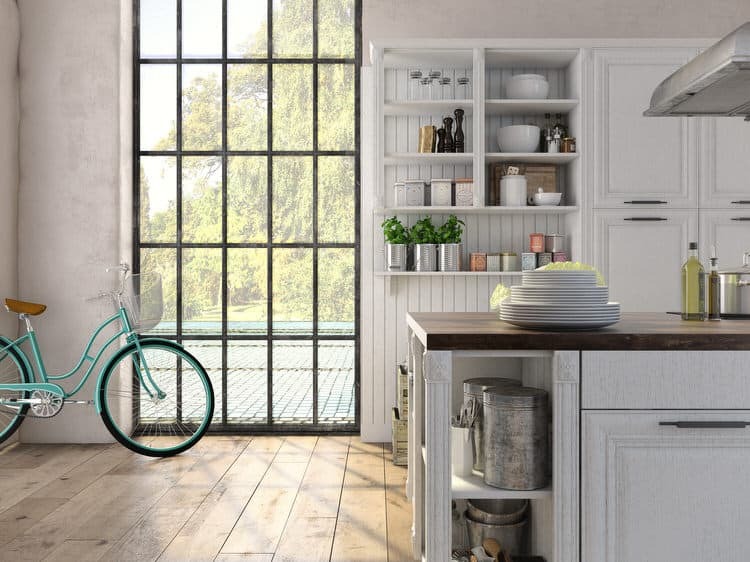 Glass front cabinets are a staple in country kitchens. They’re a great place to show off good dinnerware or collectibles. Woven cane drawer fronts and chair backs add a casual touch to the space. Removing a wall and combining it with the formal dining room opened up the kitchen in this renovated country home. The entire space has been updated with owner’s vision of vintage country style while retaining its rustic appeal. 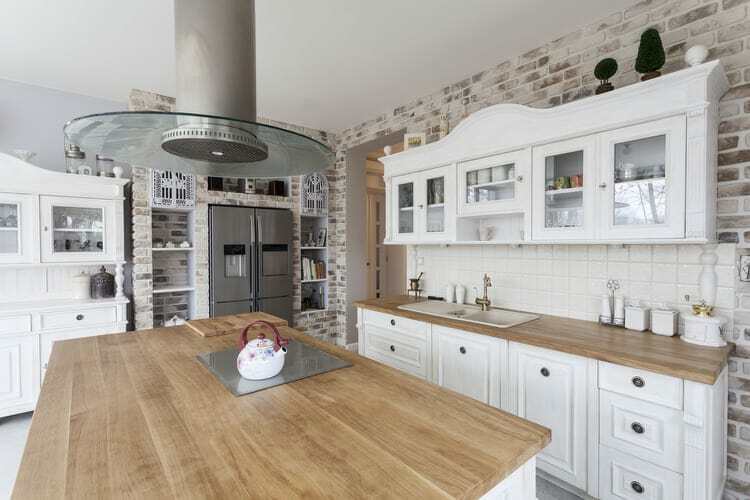 Don’t be fooled by this kitchen’s charming French country exterior. The everything behind the scenes is all modern and state-of-the-art. The massive commercial range features two ovens. The island houses the microwave and additional refrigerated drawers. To help with cleanup, two dishwashers flank the sink at the far end of the space. An old wood farm table was reworked to use as prep island in the center of this stunning country kitchen. The table was outfitted with drawers for cutlery and linen storage. The weathered piece works beautifully with the existing cabinetry. The petite crystal chandelier was a score from a recent flea market trip. 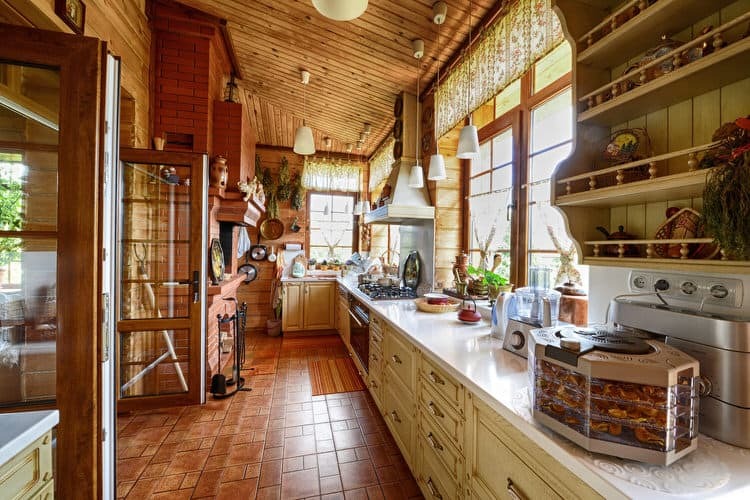 When planning a country kitchen, select items with vintage character. Choose a faucet and sink that replicate authentic fixtures. Or shop salvage yards and find the real deal. Here, a goose-neck faucet with separate taps and a white cast iron farmhouse sink enhance the country ambience. 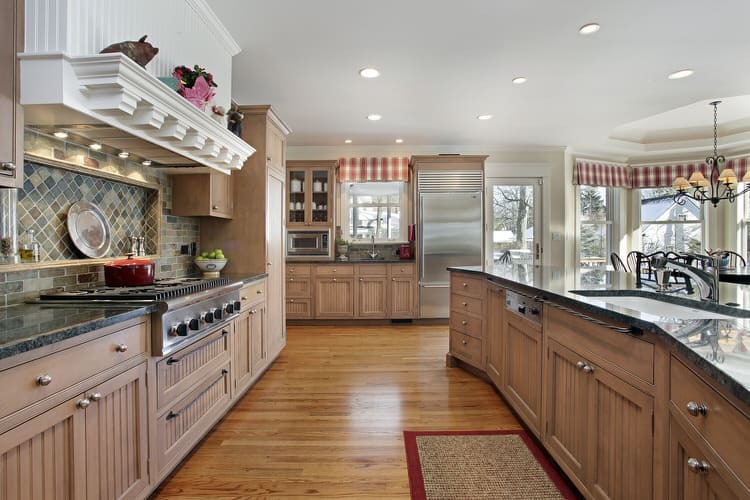 The quartersawn oak cabinets in this kitchen are substantial and classic. Here’s a nice touch: several of the lower cabinets have fronts made from metal screen instead of wood, much like antique pie safes from 18th and 19th century country kitchens. Simplicity is the key in recreating a bucolic kitchen. Take the plain backsplash in this updated country kitchen. White 4×4 tile adds a lovely sheen without causing a fuss. These inexpensive white ceramic tiles are available at any home center for a very reasonable price. Country-style kitchens take on a personal feel when you add pieces collected over time. Vintage items from flea markets, antique shops and estate sales can transform a nondescript kitchen into a room oozing with charm. 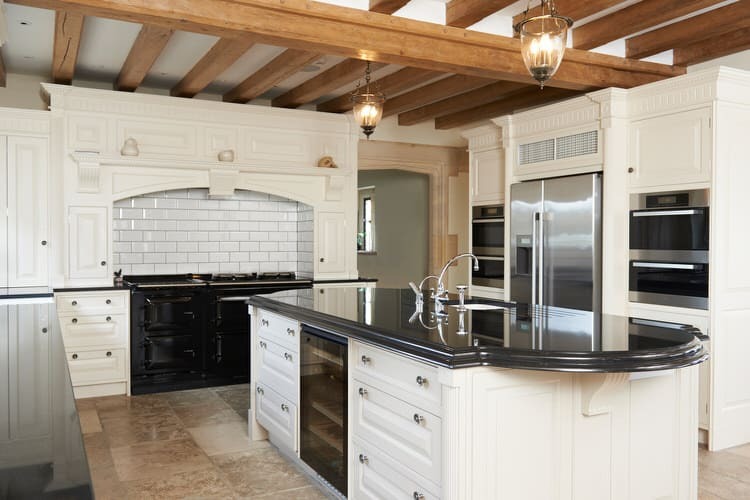 This European farmhouse kitchen goes all out with restored wood ceiling beams, polished soapstone counters and a shiny new black range. The black, white and stainless combination is a winner. It wasn’t cheap, but we think it was totally worth it! 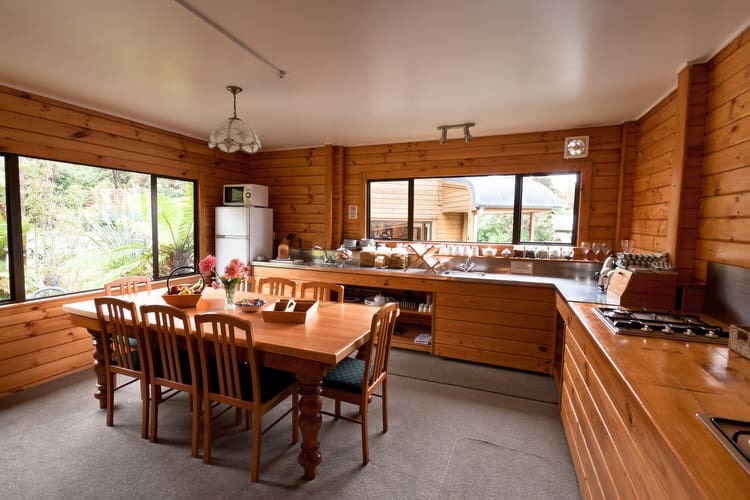 This country lodge kitchen features knotty pine cabinetry and paneling throughout. You may think of it as passé, but in log homes and cabins it remains a very popular choice because of its durability and low cost. It is a native wood that is readily available in northern regions, making it a logical choice for case goods. The owner wanted to capture the spirit of her grandmother’s country kitchen without the kitsch. Little touches of Americana are evident but don’t overpower the space. Large-scale gingham valances soften the window frames and beadboard graces the range hood and cabinet fronts throughout. 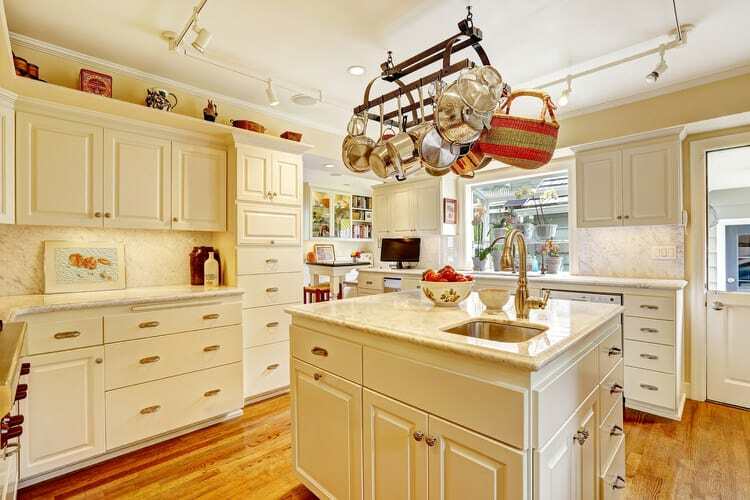 A plate rack was installed above the cooktop to display cherished family collectibles. The look and feel is very homey without being overstated.